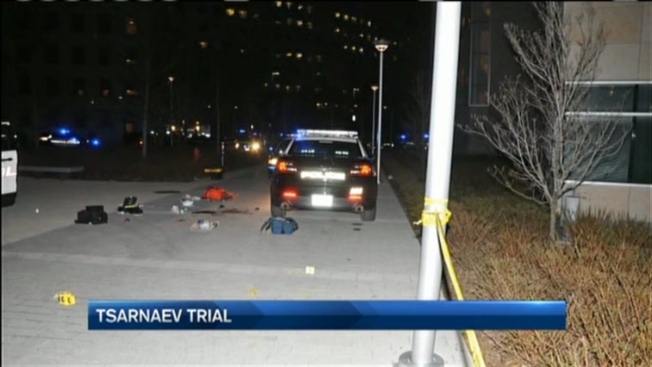 In this never-before-released surveillance video from April 18, 2013, you can see 27-year-old MIT Police officer Sean Collier's marked cruiser as he pulls up and parks on the plaza near Vassar and Main Street on the school's Cambridge campus. It was just minutes later that his friend and dispatcher, officer David Sacco, would get a 911 call. "We're hearing a lot of loud noises outside of our window," the caller said. "They don't sound exactly like gunshots, but they're sharp, quick noises. There is a police officer that seems to be within the vicinity in a car but we're really not sure what's going on." Sgt. Clarence Henniger was first to arrive and found Collier in his cruiser, bloodied and barely clinging to life. 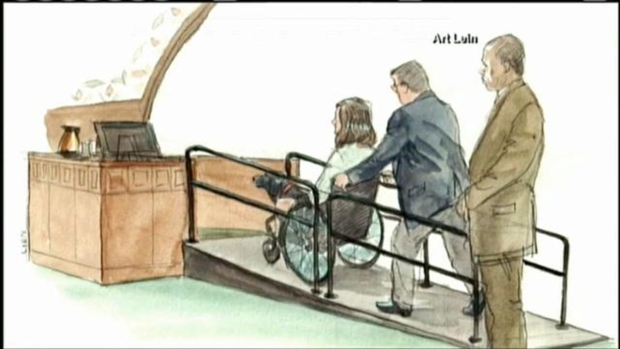 A woman testifying from her wheelchair Monday in the Boston Marathon bombing trial recalled shielding her husband from the sight of his mangled leg, being pushed to the ground as a bystander frantically tried to extinguish the flames on her body and coming to grips with becoming a double amputee. "Oh my goodness, all units respond Stata!" said Henniger on the radio. "Officer down, officer down!" As Sgt. 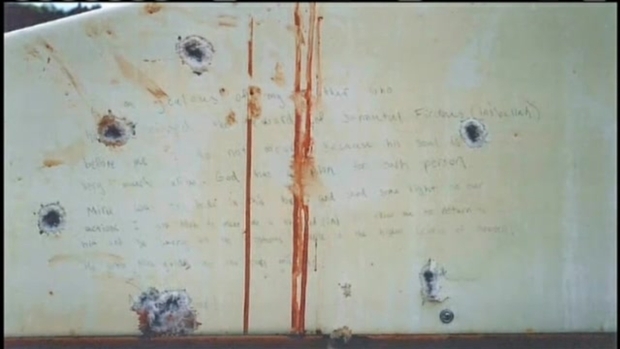 Henniger and another officer tried in vain to save Collier's life, Henniger noticed someone had unsuccessfully tried to pry his gun, now covered in blood, from its holster. It was later that night, after Collier had been pronounced dead, that surveillance video from the MIT campus was found and passed on to investigators. In it, you can see two dark figures walking up to Collier's police cruiser. The brake lights go on and off before the dark figures run from the scene a minute or two later - but not before one of them allegedly came face to face with an MIT grad student on his bicycle. That student, Nathan Harman, testified Wednesday. "When I went by, the front door was open and there was someone leaning into the driver side door," Harman said. "He snapped up, stood up and turned around, he looked startled, we made eye contact...I got a pretty good look at his face." Harman was shown pictures of the suspect from that night. He said it definitely looked like the man he had seen - asked if he saw that man in court, Harman pointed to Dzhokhar Tsarnaev.